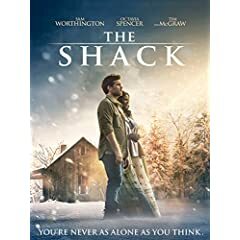 "Based on The New York Times best-selling novel, written for the screen by John Fusco (The Forbidden Kingdom) ad Andrew Lanham (The Glass Castle) & Destin Cretton (The Glass Castle), and directed by Stuart Hazeldine (Exam), The Shack takes us on a father's transformative spiritual journey. After a family tragedy, Mack (Sam Worthington) spirals into a crisis of faith and questions God's existence and life's purpose. Mack is unable to move on, until he gets a mysterious invitation to an abandoned shack. There, God reveals Himself in the form of three strangers led by Papa (Octavia Spencer). Mack's journey will transform audiences of all ages, in this movie that you will want to watch over and over." That is the official description for The Shack, now available on Blu-ray, DVD, and Digital HD from Lionsgate, which has provided NewTechReview with a NFR copy for review. I've always had a hard time enjoying family-oriented films, especially those with a religious tone to them. I suppose it's because many of them try to take some of life's difficulties or tragedies and justify them with answers that don't really provide any answers at all. Unfortunately, The Shack does this quite a bit. I'm sure there are plenty of people in the world who can relate to Mack in one way (having an abusive parent) or the other (losing a child). And it's unlikely that they want to hear that these things happen for a reason. The Shack does put a different twist on the whole meaning of life and questioning of God's existence, which makes it somewhat entertaining. When Mack goes to the abandoned shack in which his daughter was murdered to meet the Holy Trinity, we're presented with a much more modern interpretation, rather than the standard Christian representation. And I think having Octavia Spencer play the part of God is wonderful. She does an excellent job and is the saving grace (so to speak) of this film. Sam Worthington and Tim McGraw also try their best, but they're a bit unpolished in some scenes. Since The Shack also provides a supernatural element, it's nice to see that the quality of the video and audio aspects are excellent. We're presented with a 1080p AVC encode and a 2.39:1 aspect ratio that includes wonderfully colorful outdoor environments and some very well executed CGI and FX. The DTS-HD Master Audio 5.1 track also provides a very immersive experience with the surround channels being put to good use, especially during the outdoor scenes. * Touched by God: A Writer's Journey - a ten minute featurette talking about author William Paul Young and how his book came to be. * God's Heart for Humanity - a nine minute featurette that talks about the unique way in which God was represented in this film. * Heaven Knows: The Power of Song with Hillsong United - a music video. * Something Bigger than Ourselves: The Making of The Shack - a 13-minute featurette that provides a behind-the-scenes look and cast interviews. * Premiere Night: A Blessed Evening - a featurette covering the release of the film. So will you enjoy this film and should you see it? Well, in some respects it's entertaining and in others it's not. However, if you've read the book and you enjoyed that, then you will probably enjoy the film as well. While the film doesn't follow the book exactly, it's very close to the same content, although not quite as in-depth as is to be expected. If you're just watching the movie itself without any prior knowledge of the book, then you may still enjoy it, but if you're looking for the meaning of life, you won't find it here.